What Kind of Liquor Is in Tiramisu? 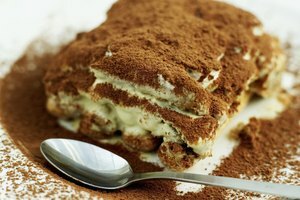 Tiramisu is an Italian dessert made with ladyfingers, mascarpone, eggs, cream, sugar, coffee and cocoa powder. This sweet treat may also contain alcohol in some cases, although this ingredient is not required to make this dessert. To make a boozy adult version of tiramisu, you can add a variety of sweet spirits to complement its flavors, including dessert wines, flavored liquors, rum or brandy. Tiramisu, as we know it today, likely originated in the Veneto region of Italy during the 1960s at the restaurant Le Beccherie, according to the "Washington Post." Carminantonio Iannaccone, the supposed creator of the dessert, claims that he used Marsala wine in his version of the original recipe to give the recipe some sophistication and balance out the flavor of the coffee. The owners of Le Beccherie disagree and claim that the version they served never contained alcohol. 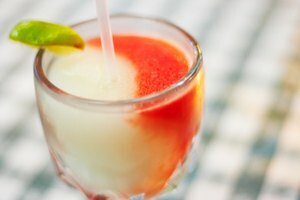 Because there are so many variations on this traditional dessert that became popular in the United States in the 1990s, alcohol is considered an optional ingredient. 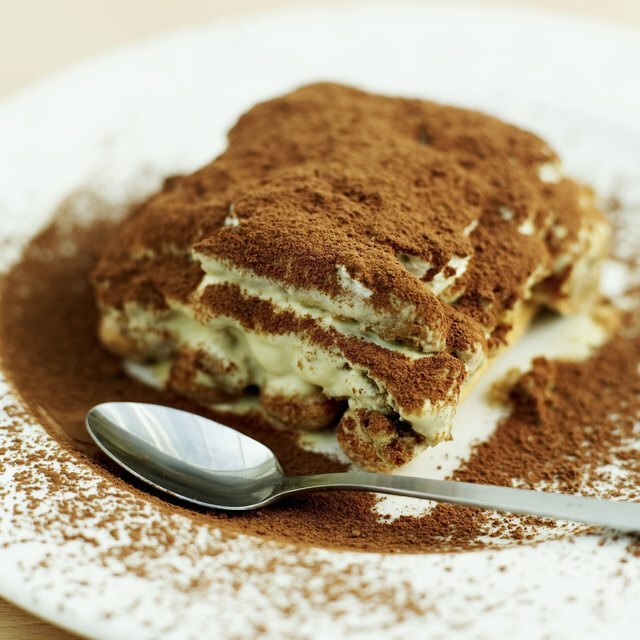 If you plan on serving your tiramisu to adults, include the dessert wine or liquor of your choice in the recipe. The most commonly used spirits are Marsala or Madeira wine, but rum, amaretto or coffee liquor are also acceptable choices to add. 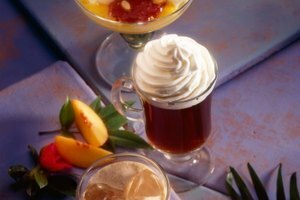 Other sweet liquors like Irish cream, orange or chocolate liquor will blend well with tiramisu's coffee and cocoa flavors. There is really no hard and fast rule when it comes to the type of alcohol you can include, so pick your favorite. If you're making a tiramisu containing fruit, such as strawberries or raspberries, which is an optional ingredient, use a corresponding fruit-based liquor to enhance these flavors in your dessert. How Potent Is That Dessert? Because tiramisu is not heated in any way, all of the alcohol that you include in your recipe will wind up in the finished dessert, making it inappropriate for youngsters to eat. Typically, the coffee and wine or liquor are combined and then used to soak the ladyfingers. Using less alcohol and more coffee will decrease the amount that ends up in the finished layered dessert. Soaking the fingers for a few seconds on each side, rather than longer, will also decrease the amount of alcohol in your finished product. 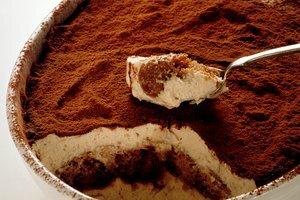 If you want to add more of a boozy flavor to your tiramisu, include a bit of the alcohol in both your coffee mixture and your mascarpone custard mixture. Some tiramisu recipes call for eggs to make the mascarpone custard that is layered between the ladyfingers. Because the dessert isn't cooked, this poses a danger because raw eggs may contain Salmonella bacteria. 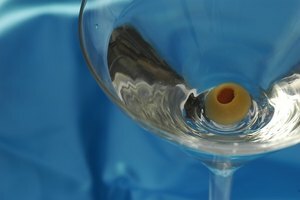 Unfortunately, including alcohol in the recipe won't kill off these harmful bacteria, warns Foodsafety.gov. For safety's sake, purchase and use pasteurized eggs, which are heated to kill off harmful bacteria but not cooked. Note that you'll need to whip the whites of these eggs for longer than traditional eggs for them to form peaks. Tiramisu made with or without alcohol will last for one week in the refrigerator, set just below 40 degrees Fahrenheit, or up to one year in the freezer at 0 F.
Ticino: What Gave the “Tiramisu” Its Name?